I’d liked Craig in Layer Cake but wasn’t sure how his Bond would stack up. Complicating matters was returning director Martin Campbell (GoldenEye), an odd choice for a franchise looking to reboot itself. Confident and cool much like the new Bond, “You Know My Name” is a near-perfect synthesis of rock and orchestral music. Fast paced and married to Saul Bass-esque opening credits, this is as much a theme song as a brash mission statement – you know his name even though much has changed. This gives further credence to the idea that the more upbeat Bond songs are best and even manages to use Cornell’s vocals well. The Bond franchise has always had a tenuous hold on continuity but Casino Royale effectively reboots the whole thing. In fact, the opening scene (shot in moody black-and-white) shows Bond earning his double-oh status as he kills his first two targets. The first is a close-quarters brawl in a cramped bathroom (“How did he die?” “Not well.”), well the second is traitorous station chief who’s been selling state secrets on the side. Well the first was tough, the already ice-cold Bond finds the second target considerably easier with the help of his trusty silenced Walther PPK. With his 00 status in place, Bond then finds himself on the trail of an international arms dealer who’s also manipulating stock prices through terrorism. The story isn’t too grand but still has global stakes, with much of the action culminating in a 2nd act poker game that serves to show Bond’s lethality and personal investment. The whole movie goes the Batman Begins route by re-introducing Bond staples in a more grounded way and jettisoning other elements (though mainstays like Q and Moneypenny would appear in later instalments). 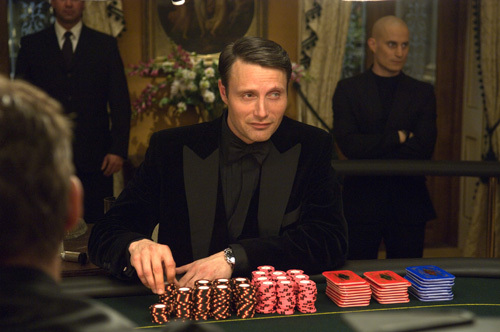 In keeping with the series new modus operandi of grounded reality, Le Chiffre (Mads Mikkelson) is less operatic than previous villains but still a credible threat to Bond. In a nice nod to the series’ past he does have a physical disfigurement (a bleeding tear duct), though memorable henchman are nowhere to be seen (a female henchwoman was written out of an earlier draft). Mikkelson is lizard-like and creepy as the suave villain, coolly uttering threats with all the panache of a bizarro-Bond. One question – why does a guy with a French name have a Danish accent? In the action department Casino Royale is second to none. Craig’s hulking physique marks him as probably the most menacing Bond yet – a “blunt instrument of death” as M is so fond of calling him. The post-credits foot chase scene in Madagascar sets a new high watermark for the series, full of elaborate parkour and elegantly conveying Bond’s methods and world view through calculated action (his foe leaps atop a construction girder while Bond simply smashes and shoots his way to the top). A later airport chase is also clearly staged and executed, while a fakeout ending allows the movie to provide a proper fire fight in Venice and end on an emotionally stunning moment. Of course it wouldn’t be a Bond film unless Vesper met a tragic end, but before that point she proves to be a fully formed character – acting initially on vengeance but eventually stripping away Bond’s armour as they fall in love. It’s likely the best and most believable romance in a Bond film yet, and lays the groundwork for James’ generally blithe attitude towards subsequent paramours. Bond also seduces the wife of a foe for information, with the results being equally deadly. The movie ends on an iconic note as a gun-toting Bond, fuelled by righteous anger and vengeance, replies to a cowering villain “The name’s Bond. James Bond.” You know my name indeed. Casino Royale is remarkably assured and effectively jettisons decades worth of baggage while retaining the essential traits of the James Bond character. The best action of the series yet combined with a focused story that allows the characters to breathe and grow means that there’s very little about this movie that doesn’t work. The poker scenes go on a little long and mess with the movie’s pacing, but that’s a minor complaint in a movie that does everything else so very right. Daniel Craig makes the character his own, drawing on Dalton’s cold-blooded take while still finding time for a well-placed one-liner. The script is flipped as he’s the one that slowly emerges from the water instead of Ursula Andress (wayyy back in Dr. No), but Casino Royale avoids pandering as it updates Bond for the 21st century while providing ample spy thrills. It’s a breathless and satisfying Bond film – the best yet.